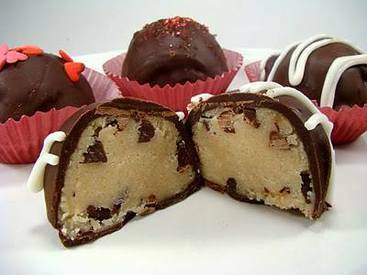 Chocolate chip cookie dough truffles! Today Is National Chocolate Chip Cookie Day, So Thsi Yummy Recipe Is Perfect! 1. Cream softened butter and brown sugar until fluffy. Beat in flour, milk, and vanilla until smooth. Stir in chocolate chips. Cover and refrigerate for 30 minutes-1hr (or longer if your batter is extra sticky). 2. Shape chilled dough into balls. I used a little scooper so all the truffles were the same size. Place on a baking sheet lined with wax paper, cover, and place in the freezer for 1-2 hours to harden. 3. Roughly chop chocolate and place in a heat-proof bowl. Boiling an inch or so of water and place the bowl on top, letting the steam melt the chocolate. Mix frequently. 4. Dip each chilled truffle into chocolate and coat until they're covered to your preference. Sprinkle with toppings immediately after dipping in chocolate.